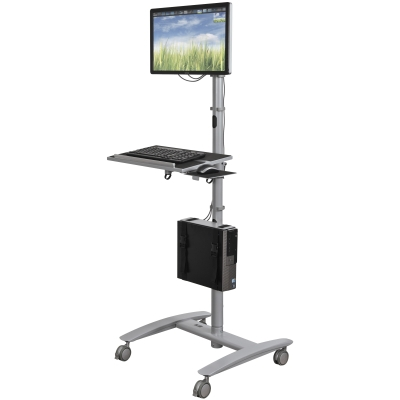 With the Beta Cart Adjustable Sit and Stand Workstation, you can improve your energy and efficiency by standing or sitting as you work, and switch positions as you choose. Mobile configuration brings flexibility into the workspace. Easily moves through small doorways and over thresholds for collaborative meetings. 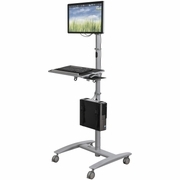 Works equally well as an A/V cart or as a compact mobile workstation, ideal for maneuvering in tight quarters. Center post works as a hub for equipment shelves, monitor mounts, and CPU holder, each independently height adjustable. Cable management clips keep cords under control.